December 28, 2012 - The Federal Communications Commission (FCC) has adopted a Report and Order establishing rules to help speed the deployment of Internet services onboard aircraft. The Commission’s action enables broadband providers to meet increasing consumer demands and promotes the economic growth and job creating impacts of ubiquitous broadband. This action also continues the FCC’s efforts to update and streamline regulatory requirements across the agency. Since 2001, the Commission has authorized a number of companies, on an ad hoc basis, to operate Earth Stations Aboard Aircraft (ESAA), i.e., earth stations on aircraft communicating with Fixed-Satellite Service (FSS) geostationary orbit (GSO) space stations. Installed on the exterior of the aircraft, the satellite antenna carries the signal to and from the aircraft, providing two way, in flight broadband services to passengers and flight crews. The Report and Order formalizes ESAA as a licensed application in the FSS and establishes a regulatory framework for processing applications while ensuring other radio service operations are protected from harmful interference. Rather than have to license on-board systems on an ad hoc basis, airlines will be able test systems that meet FCC standards, establish that they do not interfere with aircraft systems, and get FAA approval. 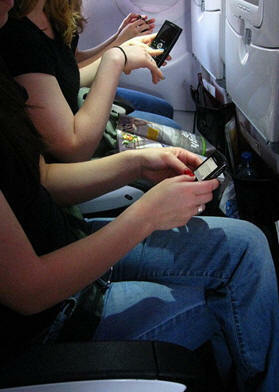 By reducing administrative burdens on both applicants and the Commission, the new rules should allow the Commission to process ESAA applications up to 50 percent faster, enhancing competition in an important sector of the mobile telecommunications market in the United States and promoting the widespread availability of Internet access to aircraft passengers. Action by the Commission, December 20, 2012, by Notice of Proposed Rulemaking and Report and Order (FCC 12-161). Separate statement issued by Chairman Genachowski.